Randall William Rhoads was born December 6, 1956, and was an American guitarist. Randall was known as Randy, and is most known for playing with Ozzy Osbourne and Quiet Riot. He was raised by his mother, Delores, in Santa Monica, California. She owned the Musonia School of Music in North Hollywood, California and began teaching Randy how to play the guitar when he was just six years old. He began by learning folk guitar, but Randy eventually began to move toward a different style of playing known as hard rock. When Randy was fourteen, he and is brother (Kelle Rhoads) formed a band called "Violet Fox", After the band dissolved, Randy began to teach one of his friends how to play bass guitar. Soon Randy Rhoads and his friend Kelly Garni, formed the band Quiet Riot. The other members of the band were Kevin Dubrow, and Drew Forsyth. The band came to be known as one of the top L.A. club bands, however, they were never able to land a recording contract in the United States. Eventually, they were able to obtain a major record deal in Japan under CBS/Sony Records and went on to release two albums, "Quiet Riot" and "Quiet Riot ll". In 1979, Ozzy Osbourne began to form his solo band, during a interview with Raw Power Magazine Randy's name was mentioned to Ozzy. The next day Robert Olshever asked Dana Strum of Slaughter / Vinnie Vincent Invasion to contact Randy for an audition with Ozzy. Randy was given the job during the process of warming up. Osbourne has said that Rhoads sounded like "God entering my life". Randy respectfully recommended his friend Greg Leon to Quiet Riot and began playing for Ozzy in November of 1979. The first album that Randy began to work on with Ozzy was called "Blizzard of Ozz", which produced hits as "Mr.Crowley" and "Crazy Train". After the tour, the band wrote another album called "Diary of a Madman". On this album there was a different line up of the band, because Sharon Osbourn fired Lee Kerslake and Bob Daisley, they were replaced with Tommy Aldridge (Pat Travers Band, Ozzy Osbourne, Gary Moore, Thin Lizzy, Black Oak Arkansas) and Rudy Sarzo (Quiet Riot, Whitesnake, Dio). The album was released in 1981. Both Ozzy albums were very successful, however, after "Diary of a Madman" was released, Randy began thinking about leaving the band for a short time to pursue a degree in classical guitar at UCLA. Around the same time, Jackson generated a signature guitar for Randy, the Jakson Randy Rhoads also known as the Randy Rhoads Pro. The guitar was released after the death of Rhoads. 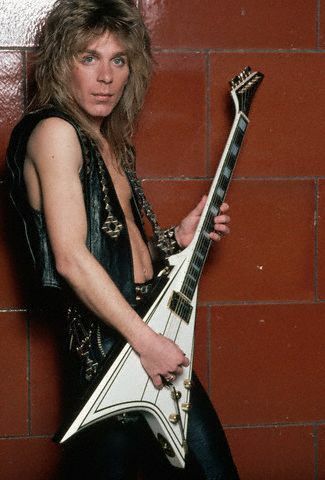 Randy Rhoads died in 1982 on March 19, in Knoxville, Tennessee. Rhoads died in a plane crash that he and Andrew Aycock as well as the band's hairdresser Rachel Youngblood were flying in. During the flight, Aycock was trying to fly low over the Ozzy & the band's tour bus and succeeded twice, but the third time the left wing clipped the bus. The plane then hit the top of a pine tree and landed in a garage at a nearby house, the three were killed on impact. Randy now rests in San Bernardino, California at the Mountain View Cemetery. Know more about what gear Randy Rhoads used? Please Contact Us.